Ugh I’m soo sore and exhausted from today, but it was our best peak climb yet! 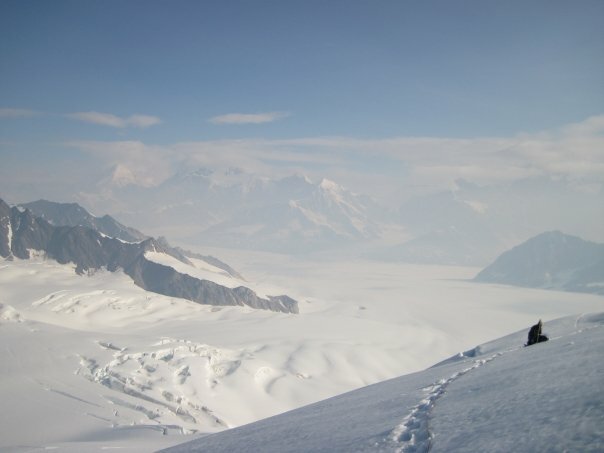 While half the group went with Jaime and Andy up Meteor peak, my group decided to cross the glacier and climb an unnamed peak that was within 200ft of the same height as Meteor. Being the climb leader, I had to get up at 3:30 am and check the day’s weather. We decided to do that so early because it has been so hot on glacier (80+F in the day… odd right?) and last night it was cloudy which holds in the heat and making the snow slushy and hard to climb or even snow-shoe on. So, I got up and the snow was still slushy, but we decided the earlier the better and left camp at 4am. 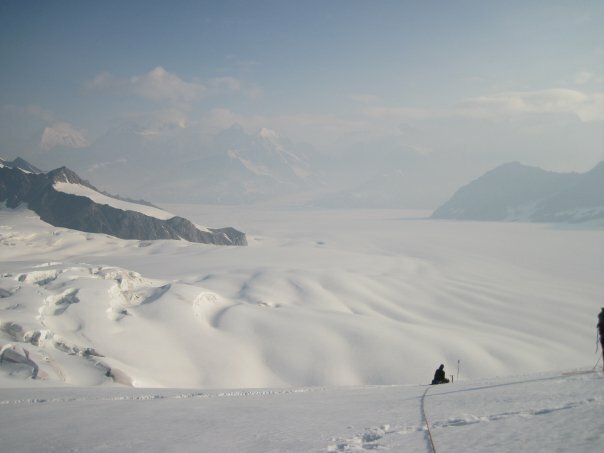 It took our team about an hour to cross the 2 mile wide glacier, and then we took a break before starting up the mountain. JP was the leader for the first half of the mountain, and it was funny because he kept zigzagging and we thought he looked lost. The next leader was Geoff, who did a good job getting us over some pretty big crevasses as well as up the mountain efficiently. The view on the way up was absolutely incredible too! There were huge blue crevasses and ice falls everywhere, and since this peak was one of the higher ones in Divide basin, we could get an awesome view of the landscape. 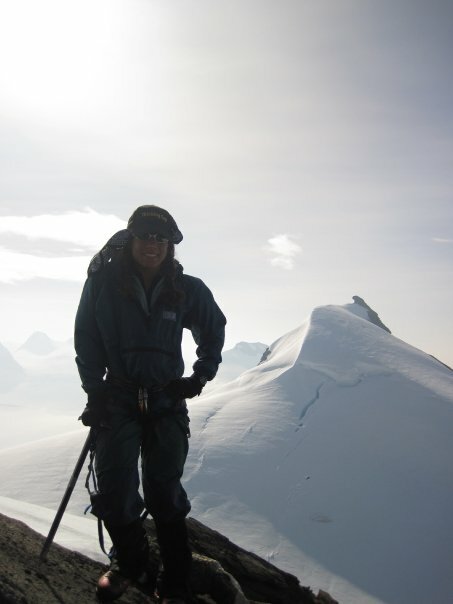 When we finally got to the summit (about 5 hours later), the view was spectacular, and we felt very accomplished. The summit was half rock and half snow, but we realized the snow was cornice, so we only walked on the rocks. I took some pretty cool pictures, and then Kai surprised us all with 2 malt-balls each! Oh they were soooooo good. We chilled out for a while before deciding to descend down the mountain. Remember how I said the snow was a bit slushy in the morning? Well it was even MORE melted by now, so we glacaded on snowshoes down the mountain. It was so awesome since it was pretty much skiing, and a climb that took us five hours to go up only took one to go back down! 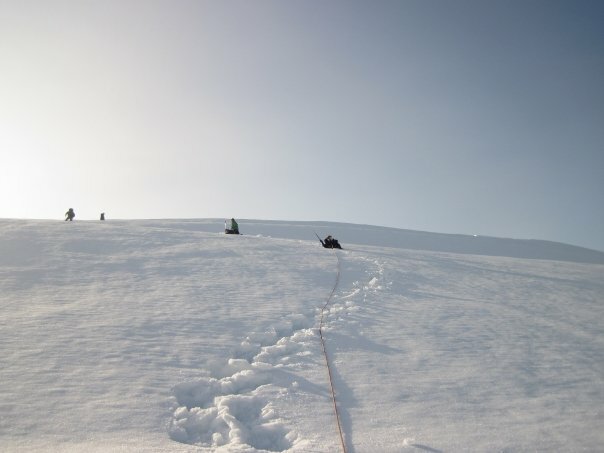 Once at the bottom, we decided to push ourselves and increase the pace back to camp. I was ok, but when we finally got back, I was exhausted and sore, so I took a two hour nap. We all rested and ate, then had a really cool first aid class to prepare us for our independent student travel. Then we discussed tomorrow’s peak ascents. My group was due to climb Meteor, but seeing how tired I was today (and how sore my feet are) I decided to make tomorrow a rest day. Also we were informed we’d be doing some heavy travelling days starting the 9th, and I’d like to be well rested for those. I know Andy, Emil, and a couple others are staying too, so I won’t be alone. Minus those speed bumps in the first week, I think the course is going well! I love how quiet, peaceful and simple the wilderness is. Hopefully I can check it out again later in life. Oh also while I was napping today, I woke up with a jolt to the sound of low flying aircraft. None of us could find them in the sky, but one created a sonic boom which was awesome! Also the boom triggered several avalanches (none near camp) that were cool to watch. Well that’s pretty much it for today. I’m looking forward to a relaxing day tomorrow to soak up Divide Basin one last time before we leave it, as well as rejuvenate my muscles. Write back later! Miss everyone! Are there any immediate hazards that could hurt me or the patient? MOI – Mechanism of Injury = what happened here? Number of patients – do I need more resources? Who is more critical? Circulatory – any severe bleeding? Heart rate? Disability – broken bone? Dislocation? Heart Rate – take at least 20 sec and multiply by 3. Take notes: strong, regular, fast, shallow, weak, etc.